"At the seashore there is a green oak with a golden chain, around it walks a knowledgeable cat night and day". So begins the famous fairy tale "Seashore" ("Лукоморье", in Russian) by A. Pushkin. Here, we see the oak and the cat of the opening scene, as well as several other scenes from the fairy tale. 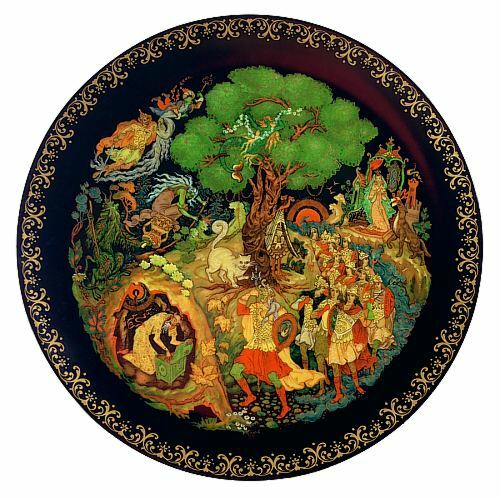 This collectible plate is based on a lacquer miniature by Palekh artist Roman Belousov. It's in excellent condition and comes with the original documents and box.